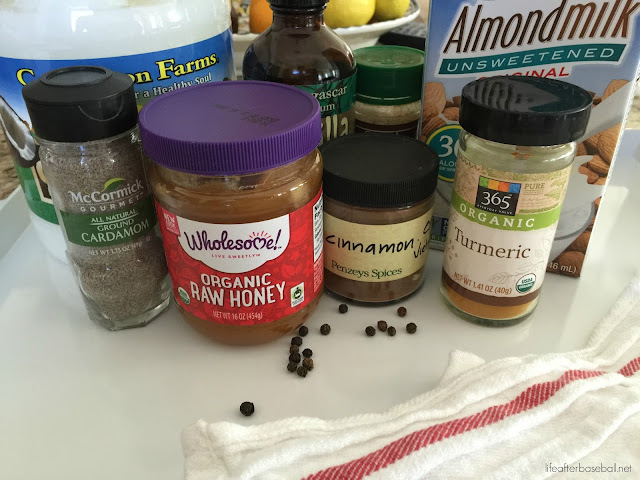 Other than turmeric being good for you this drink is so tasty that you'll want to make a big batch of it to warm up a cup for yourself everyday. Even if you aren't a health fanatic you'll find yourself craving this drink. Plus it doesn't hurt that you're being healthy and bumping your immune system up a notch this time of year. I ran across this recipe on the Naked Cuisine blog by Chantelle and I knew I had to make it asap. I made a few minor adjustments to her recipe just because it's what I had on hand and didn't feel like making another trip to the store. Anyway, I used ground ginger instead of fresh, 1 tsp of cinnamon instead of 2 and I sprinkled my cardamom in instead of using a pod. Oh, I also forgot to take out my peppercorns so they were blended with my drink both times I made it. LOL-I actually like it and will keep making it that way. Actually turns out that peppercorns help the absorbtion of the curcumin (main active ingredient in turmeric) so just an added bonus for moi. Click here for her recipe. Ignore the vanilla in the pic...decided against it! I can't believe I've never heard of turmeric milk before, but hey you learn something new everyday. I also love how you used what's in your kitchen, sometimes you have to do that Charity. I think I may try this out. Happy Holidays to you and your family. 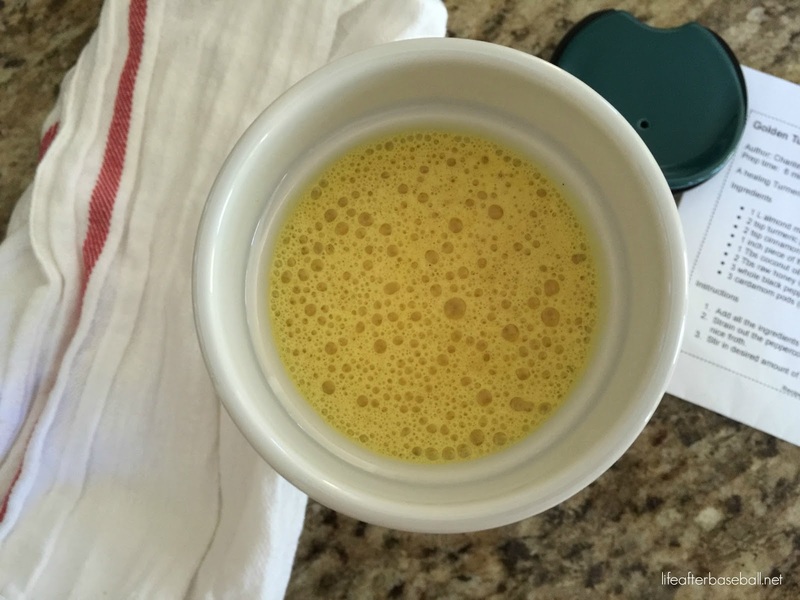 I never hear about turmeric milk recipe before! Very interesting! Thanks for sharing! I keep hearing about how good this is for you! I'm going to give it a try one of these days! 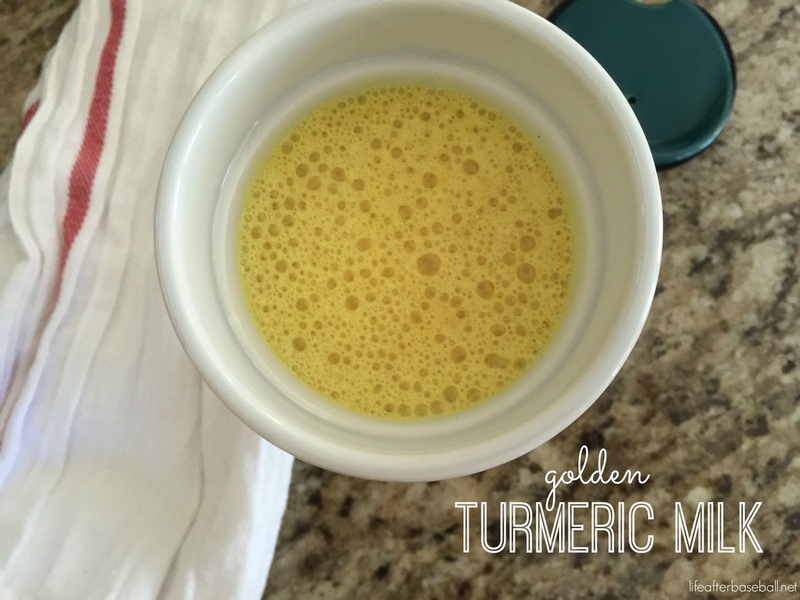 I have never heard of tumeric milk before! May need to do some more research!